Quantum Arts Jam will merge art and physics in three different sessions. Together with the artists we will turn an equation into a painting and the Universe into a real dance. “We are physicists, constantly asking questions. From time to time we do find answers in experiments, formulas, even theories. However, we imagine things we cannot always picture. Quantum physicists will work together with the artists in improvised jam sessions, with an intention of creating atmosphere that speaks the dialogical language of quantum physics and art with both of its form and content. A dialogue between a crazy Irish quantum physicist and a fascinating London-based artist who was once a quantum physicist herself. This is what happens when a physics professor meets her best friends artists over a coffee to chat about the life and works of one of the most well-known physicists of all times: Richard Feynman. The dance of the Universe is definitively a tango! Esko Valtaoja and Fabrizio Mocata will tell the story of the Universe as you’ve never heard before. Enable our project by choosing the sum you are wishing to support us with! We will provide the Quantum Arts Jam Session! We will provide an edited video of the Quantum Arts Jam Session after the event, available for anyone online! We will provide a live streaming of the Quantum Arts Jam Sessions, available anywhere in the world! We will provide everything mentioned above, plus a thank you event attached to the Jam for anyone who supported us! Both partners, Science Café and Aboagora symposium have the intention for cross-disciplinary and multi-artistic scientific and artistic communication, and making scientific information more approachable for the audience. With their joint effort they are hoping to address both the quantum physics professionals and interested audience from the region of Turku and around the world. Enable the Quantum Arts Jam Session with the sum of 10 Euros! Enable the Quantum Arts Jam Session with the sum of 30 Euros! Enable the Quantum Arts Jam Session with the sum of 50 Euros! Enable the Quantum Arts Jam Session with the sum of 100 Euros! Enable the Quantum Arts Jam Session with the sum of 200 Euros! Enable the Quantum Arts Jam Session with the sum of 500 Euros! 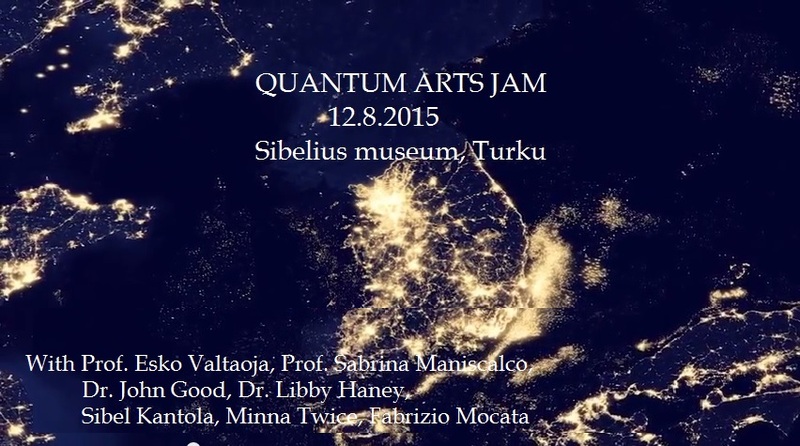 Enable the Quantum Arts Jam Session with the sum of 800 Euros!